On Saturdays July 15th and Aug. 19th, those 16 and older can join a Horizon Team to help build a house for a family (pictured) in Madisonville. 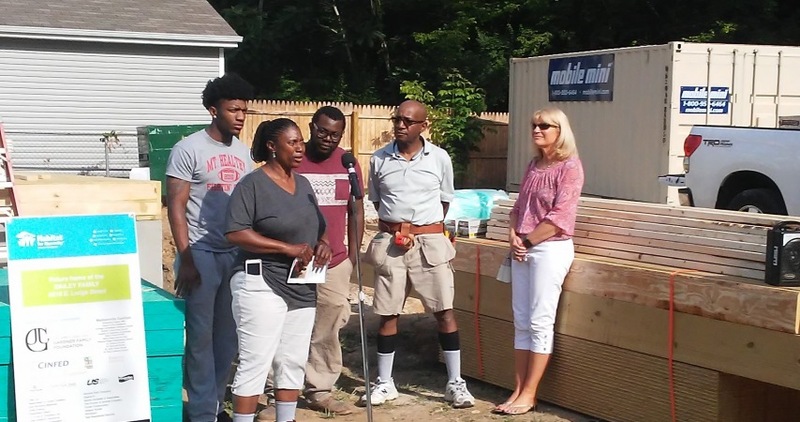 They have over 50 hours in building other Habitat homes and are now ready to work alongside you at their Habitat home. The day starts at 8:30 a.m. and ends at 4 p.m., but you are not required to work the full day. If you’d like to participate, click on the Sign-Up Process button below and follow the instructions. All sign-ups must be done at least 3 days prior to the event date. Please note: to be present on a construction site, volunteers must be at least 16 and have a parent/guardian/adult (over age 21) volunteering with them if under 18. Volunteers ages 16 & 17 are not allowed to do roofing, demolition, use power tools, or use ladders over 6ft. At least 1 adult (over age 21) is required to accompany every 5 minors. Please wear closed-toe, closed-heel shoes for your safety. Tools, training, and safety equipment will be provided on site. Expect to have fun! The build site address is: 6516 E. Ledge St., Madisonville, OH 45227. Click here for additional helpful information about working on the construction site. If you have questions about registration sign-up or you'd like to help provide lunch, drinks or dessert for the team, contact Trevor Hamilton at 513 680-4380 or email twhvt23@gmail.com.